It is important to know several curtains for complementing house interior. Curtain is basically a great decoration object that serves nice function, and it is important to put attention here. There are basically several types of curtains. However, this article will limit the types based on headings only. Heading of curtain is what can be seen in the top of curtain. It really can dictate or characterize atmosphere within room. That way, it is also possible to find appropriate or proper curtain heading for current house interior theme applied. The first curtain heading is known as pencil pleat. As the name suggests, the heading will look like sharp pencils lining on the top of curtain. The neat pleat on the curtain is somehow nice for classic theme. We all know that we often see curtains pleated neatly, and pencil pleat just enhances such impression. Typically one fold of curtain fabric creates two or three pencil pleats, making the drape awesome and dramatic. As one types of curtains based on heading, this model is definitely worth to consider for classic house. The next type is known as tab top. 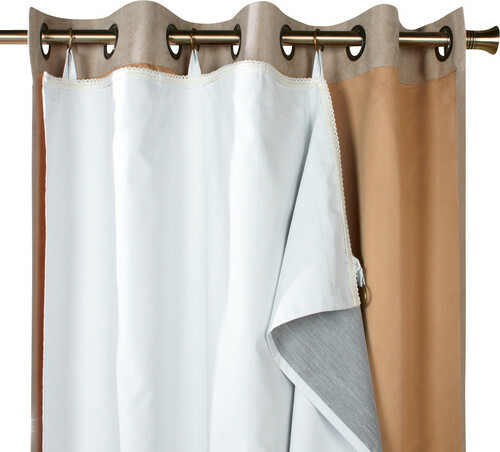 A curtain tab is similar to ring for sliding the curtain. However, it is made of fabric instead of metal. Tab top is generally more futuristic if compared to previous one. It does not have wrinkles on top (similarly found in the pencil pleat curtain) which lead to simplistic, smooth, and arranged drape. It is absolutely recommended for modern office window, but it is also possible to apply that to other windows. The last curtain type is known as metal ring. The metal can be anything, and it will be tucked on the curtain itself. Indeed, it is possible to have just holed curtain (without metal ring), but it will be damaged overtime because of friction. Those are all types of curtains based on their headings.